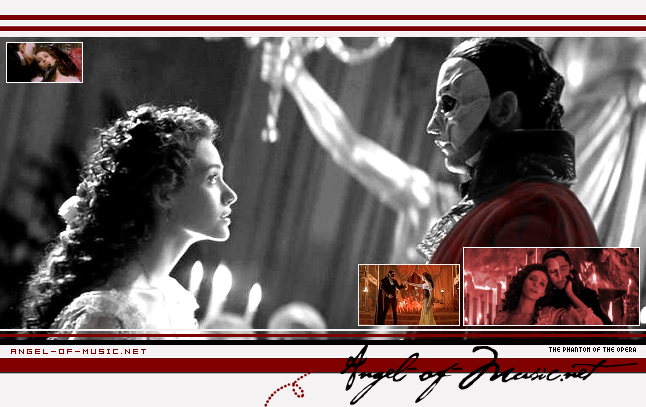 ANGEL-OF-MUSIC.NET :: Phantom Lovers - The Phantom of the Opera Fans - Books, Films, and/or Stage! 721 fans, from 58 countries, have proclaimed their love of Phantom, and 0 are waiting to be heard! You have reached Phantom Lovers at Angel-of-Music.net! The purpose of this site is to unite fans from around the world, who love the beautiful, tragic and timeless tale, The Phantom of the Opera! It works with much the same principle as a fanlisting or a clique. We aren't exclusive to any one version of the story, so if you're a fan of any of the Books, Films and Stage, you are welcome to join by adding your name to the list to proclaim your love of Phantom! A website of your own isn't required to be listed, but if you do have one and want it linked from here, please link back to the site. When submitting your information, feel free to include why this beautiful, haunting and magical story is special to you! Under The website you will find links to AIM icons, MSN icons, LJ icons, our affiliates, links and information for more Phantom related material, including authors who have written their own version and/or sequels, and web directories we're listed at. If you have anything you would like to contribute to the website, such as wallpapers, icons, fanfiction, anything Phantom at all, please send here. have fallen under the spell of the Angel of Music. This is a non-profit fansite, and has no affiliation with anyone involved with The Phantom of the Opera.